DAR ES SALAAM, Jan 8 2013 (IPS) - Avelina Elias Mkenda, a 52-year-old small-scale farmer in the Mbarali district of Tanzania’s southwestern Mbeya region, can sense a change in her environment. A resident of the Great Ruaha River basin, she has never had trouble watering her crops and livestock. But over the last few years, the river has been delivering less and less of the precious resource; the grass that was once plentiful is now scarce, leaving cattle hungry, while production of coffee, the region’s prize crop, has plummeted. Referred to as Tanzania’s “ecological backbone”, the Great Ruaha River originates in the Kipengere mountains and stretches roughly 84,000 kilometres, flowing through the wetlands of the Usangu Valley and the Ruaha National Park, eventually emptying into the Rufiji River. Its basin catchment area waters a massive expanse of the Tanzanian countryside. Over a million small-scale farmers produce a significant portion of the country’s food on the lush soil in the Ruaha basin, which also provides 70 percent of Tanzania’s hydroelectric power, according to government sources. But officials from the Rufiji Water Basin Office (RWBO), which administers the Ruaha basin, along with academics from Tanzania’s leading Sokoine University of Agriculture (SUA), are now warning that the river is under “alarming stress”. “The river has been drying up for lengthy periods of three months (at a stretch), up from the short period of three weeks,” Damian Gabagambi, an agricultural economist at SUA, told IPS. He believes the crisis is largely due to an increasing number of farmers diverting the river for irrigation purposes. “Prior to 1993 the river was never dry,” Andrew Temu, an SUA professor, told IPS, adding that the three-month-long dry spells began in 1999. In this time period, river basin inhabitants increased from three to six million people. “With the increasing population, there is a corresponding demand for more water,” he said. Intensive grazing and deforestation have also contributed to the looming crisis. Furthermore, a lack of proper irrigation infrastructure means that much of the water goes to waste, Gabagambi added. RWBO Community Development Officer David Muginya told IPS that agricultural projects by both large and small-scale farmers have failed to honour the 2009 Water Resources Management Act, which obliges all water users to deploy proper infrastructure in order to avoid waste. A 2012 University of Dar es Salaam report released last July, ‘Vulnerability of People’s Livelihoods to Water Resources Availability in Semi Arid Areas of Tanzania’, found that water wastage is also making the one million people dependent on the water resources downstream of the Great Ruaha River extremely vulnerable to an acute water shortage. All the signs suggest that the current management of natural resources is unsustainable and could result in irreparable damage to the environment. 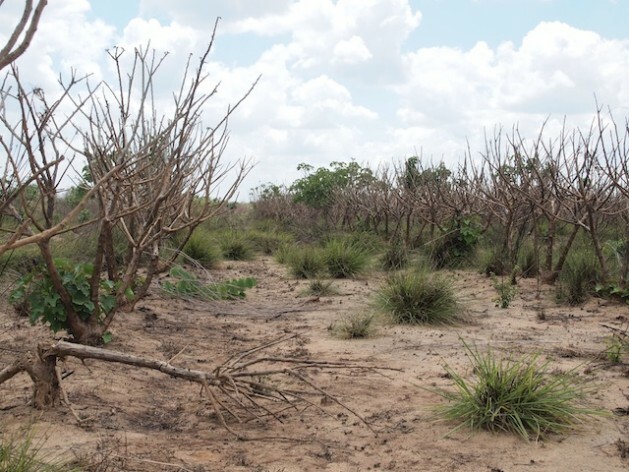 “The situation has been endangering the lives of millions of people living in south-central Tanzania, who are at risk of growing poorer if the environment is left in a dilapidated state,” Gabagambi warned. Experts believe the impact on agriculture and food production will extend far beyond the immediate vicinity of the river basin, affecting a huge portion of Tanzania’s 46 million people. RWBO officials, meanwhile, are concerned about the future of the country’s hydroelectricity supply. Large-scale agriculturalists in the region, who say they have plans to build adequate irrigation infrastructure, charge that smaller farmers access water channels illegally and should be made to pay for their water use. But small farmers like Mkenda, from the Mbarali district, say they have no choice. With changing weather patterns, more intensive sun and now a shortage of river water, her coffee crop has suffered, resulting in even lower income. “We do not have the money to put (irrigation infrastructure) in place,” she lamented. Ironically, it is these small farmers that will be most affected by the water shortage as they struggle to eke out a living beside a dying river. Other experts like Bariki Kaale, an environmental and energy specialist with the United Nations Development Programme (UNDP), blame the problem on “mankind’s destruction of water sources”. He said the Ruaha basin used to have a plentiful water supply until all the trees were felled. His opinion is substantiated by the findings of a report submitted to the World Wildlife Fund (WWF)-Tanzania on the causes of biodiversity loss in the Ruaha catchment area, which stated, “Locals (from the) Makete District believe tree plantations (especially various species of cypress and eucalyptus) are associated with the environmental degradation that is taking place in this area. “Due to excessive tree felling for timber, some of the areas have been cleared and exposed to erosion agents. Tree felling for timber and logs has also contributed to widespread deforestation in the area leading to soil erosion and siltation in the rivers,” the report added. “We now don’t have water for hydropower (and) we will have no water for drinking in the near future,” the U.N. specialist warned. Around the globe the rivers are drying..
Simon, wife of the late Senator Paul Simon. Too many Africans is the cause of Global Weirding. More UN promoted, population reducing, Vaccinations are needed. Is this tongue-in-cheek or just plain ignorance? Asia’s population – 3.88 billion; Africa – 1.03 billion; North & South America – 0.9 billion; Europe – 0.74 billion. So, what is the basis of your comment? Africa’s problems are not because of its population; they are largely due to systemic corruption and ineptitude on the part of government as well as collusion from foreign governments that the status quo benefits. Questioning the Eco-Malthusian-Propaganda — Ignorant Not. We are past peak Sanity — “better bad news” is a comedy site. “systemic corruption and ineptitude on the part of government” ? Government is efficient at maximizing corruption, and occupying opportunity.